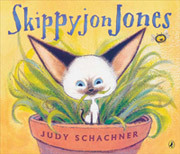 Skippyjon Jones is no ordinary kitten. Oh, no...He's actually El Skippito, a great sword-fighter ready to battle banditos the world over! With a little imagination and a whole lot of fun, this frisky cat dons a mask and cape and takes on a bad bumble-beeto to save the day. And along the way, he'll be sure to steal young readers' hearts, yes indeed-o!